Filed to: Every. Single. Year.Filed to: Every. Single. Year. 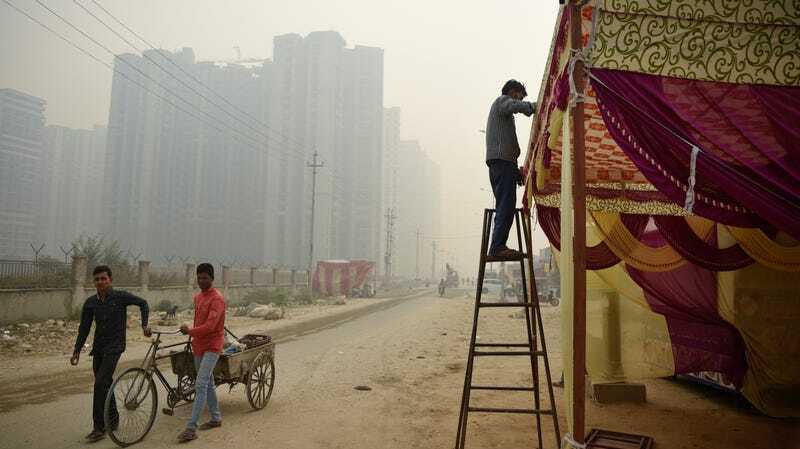 Smog-filled skies hover as people prepare for Diwali near New Delhi, India, on November 5, 2018. In India, the season for celebration has arrived. Diwali, or the Festival of Lights, began this week. That means lots of firecrackers for the people who live in the northern part of the country. But sadly, in recent years celebratory smoke isn’t the only thing filling the sky. So is smog. A plume of haze has descended on Delhi’s skies, as NASA satellites have revealed. However, firecrackers aren’t to blame; crop burning in northern states like Punjab and Haryana is. Once November hits, harvest season is pretty much over, so farmers burn whatever rice or straw remains to cost-effectively prepare for next season. This burning is ramping up despite an increased awareness of the dangerous health effects of the choking smog it contributes to. People in India die from inhaling their polluted air: 2.5 million a year, to be exact. In 2016, the toll included more than 100,000 children younger than 5 years old, per a World Health Organization report this year. In addition to farms, pollution from factories and vehicles also contributes to Delhi’s choking haze, as the Natural Resources Defense Council notes. All those red dots are fires burning, captured from NASA satellites October 30 to November 1, 2018. This past weekend, nearly half of the air monitors near the capital of New Delhi read levels that were at “severe” or “severe-plus,” according to an Indian newspaper. This meant some regions saw air quality 25 times worse than what’s safe to breathe. Particulate matter, the pollutant usually to blame here, can cause lung and even heart disease, as the particles are small enough to enter the bloodstream when inhaled. Officials hoped these measurements were a glitch, but the region’s seen air pollution levels spike many times before. Last spring, dust storms repeatedly shot particulate matter to hazardous levels in New Delhi and surrounding regions. Weather was the culprit there. A year ago, particulate matter in the city got so high Chief Minister of Delhi Arvind Kejriwal called Delhi a “gas chamber”. The visibility was so poor that people were dying from car accidents. India’s Supreme Court banned fireworks for the 2017 festival season hoping it would help alleviate some of the air pollution concerns. This year, the Supreme Court didn’t issue an outright ban on fireworks. Instead, it ruled in October to limit their use between 8 p.m. and 10 p.m. and banned online sales. This should alleviate some of the local air quality concerns, but tackling the greater air pollution issue will be a lot harder. The government, however, is trying. That’s why it launched the National Clean Air Programme earlier this year. As part of that plan, it announced a target last week to reduce particulate matter levels by 30 percent from 2019 levels in five years. A formal announcement explaining exactly this will happen should come later this month. In the meanwhile, last year’s expert advice that people start rocking oxygen tanks on their backs to Keep Calm And Carry On remainsD relevant. People in Mumbai, India, celebrate Diwali back in 2016.